Machinery Hill @ The Grand Kabaret! Name: Machinery Hill @ The Grand Kabaret! This Minneapolis-based band takes their name from the Minnesota State Fair’s large display of farm equipment. Their original style blends American folk with unexpected touches of ska, klezmer, celtic and a bit of rock & roll. If you look up “diverse” in the dictionary, it says “see Machinery Hill.” Catchy original songs with well-crafted lyrics are showcased along with striking interpretations of traditional tunes. 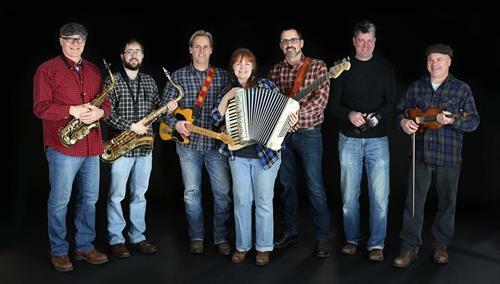 They have performed along with such diverse acts as Beausoleil, Buckwheat Zydeco, Frente, Phish, Black 47, Brave Combo, Eugene Chadbourne, Jimmy Carl Black and Queen Ida; and have headlined at The Great River Folk Festival, among others. Machinery Hill is the 1996 winner of the Minnesota Music award for best world beat CD, the 1999 MMA winner for specialist recording and has been included in TPT’s series MN. Original (episode #226).